No I’ve never been to Mardi Gras, or had the pleasure of stumbling around drunk in New Orleans in search of beads…. but I have driven down bourbon street….with my kids in the backseat. 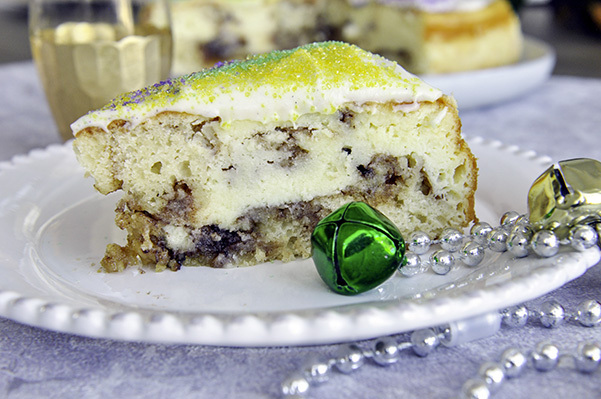 But that doesn’t mean I can’t tell you about the best dang dessert for Mardi Gras! This idea started through a simple instagram tag from my cousin. “Learn how to make this and ship it to me” she said. It was a picture of the King Cake Cheesecake from Copelands of New Orleans. “OOO…Intriguing” was my only response, but the image stuck with me. This cake has a cinnamon roll bottom, layered with cheesecake then topped with another thin layer of cinnamon roll pastry and frosting. The idea of this was starting to really get to me. I imagined a sweet cream cheese icing giving way to a thick, tangy cheesecake layer which breaks to a chewy soft bready layer of cinnamon roll. Uhhh… yum. I dreamed about it last night and so I thought this was something I had to make. A pastry that combined me love of cinnamon rolls and cheesecake… how bad can that be! ?